Includes 30 lessons and reading instruction on 16 CDs (16 hrs.) and a Reading Booklet. Did you know that Spanish is the world’s second most commonly spoken language? For Americans, it’s one of the easiest to learn, and you won’t find anything faster or easier than the Pimsleur® Method. Even knowing a little bit of Spanish will make travel to Latin America or Spanish-speaking countries a breeze. 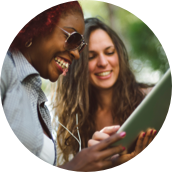 Whether you want to travel, communicate with friends or colleagues, reconnect with family, or just understand more of what’s going on in the world around you, learning Spanish will expand your horizons and immeasurably enrich your life. - Quick + Easy – Only 30 minutes a day. - Portable + Flexible – Core lessons can be done anytime, anywhere, and easily fit into your busy life. - Proven Method – Works when other methods fail. - Self-Paced – Go fast or go slow – it’s up to you. - Based in Science – Developed using proven research on memory and learning. - Cost-effective – Less expensive than classes or immersion, and features all native speakers. - Genius – Triggers your brain’s natural aptitude to learn. - Works for everyone – Recommended for ages 13 and above. 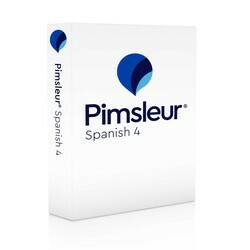 Builds upon skills taught in Pimsleur’s Spanish Levels 1-3. You’ll be speaking and understanding Spanish with near-fluency and with considerable skill. In Level 4, the pace and conversation moves more rapidly, making way for even more substantial mastery of vocabulary and structures. - Work related travel: meetings, projects, conferences, appointments; using a business center in a hotel; making conversations in an educational setting. - Accommodations: reserving a room, requesting an Internet connection, getting help with luggage, asking about breakfast and dinner hours. - Shopping: getting around in a department store, trying on and buying various items of clothing, asking for colors and sizes, buying gifts and souvenirs, going to the market. - Vacationing: going to the beach and swimming pool, sunbathing, choosing inside or outside seating at a restaurant, taking a walk, talking about sports. - Family and friends: conversing informally with and about friends and extended family, talking informally about everyday situations. - Smalltalk: expressing opinions, wishes, and stating views; asking how someone is feeling; talking about books. - Weather: describing types of weather: rainy, windy, sunny, humid. After Lesson 30, a short story broken down into 20 manageable segments (65 minutes) is provided for practice reading Spanish. Spanish is the official language of 19 Latin American nations, as well as Spain, the Dominican Republic, and Cuba. Further, it’s one of the six official languages recognized by the United Nations. Pimsleur's Spanish programs teach an educated Latin American Spanish, featuring speakers from Colombia and Mexico. Students can expect to understand the lessons clearly and to be understood by Spanish speakers everywhere. - CDs are formatted for playing in all CD players, including car players, and users can copy files for use in iTunes® or Windows Media Player®.